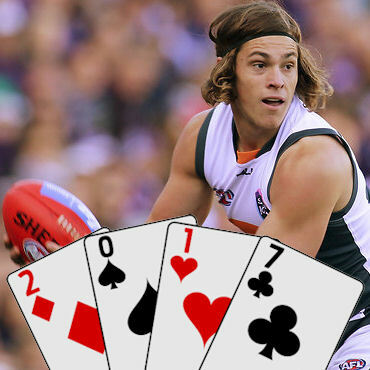 Does new Saint Jack Steele deserve a gig in our forward line this season? Jack Steele is a natural ball winner, and I’m a sucker for ball winners. He has always had a brilliant Fantasy game at junior and secondary levels, as can be proven with his much famed 2016 NEAFL stats. Yes I admit the timekeepers must doze off and I could probably lay 10 tackles in the NEAFL, however even that considered a DT average of 156 must be recognised! Steele played 10 games, kicking 15 goals and averaged 36 disposals, 8 marks, 8 tackles and 7 inside 50’s. Wow. Even this form wasn’t enough to break into GWS’ stacked midfield, which might be a bigger reflection on the quality they have rather than suggesting Steele can’t make it at AFL level. What Steele lacked at GWS was opportunity, he hardly ever got to run through the midfield, mostly being restricted to a half forward role. He adapted and did his best for the team, but it’s simply not his natural position. Unsurprisingly we didn’t see his best football. That’s exactly why he moved to St Kilda. Do you really think he would have signed with the Saints if they hadn’t promised him a midfield role? He’s a contested ball beast and that’s exactly where he wants to play, as suggested by the man himself last week. There’s a lack of reliable premium forward options this season, having lost many of last seasons guns to the midfield. This has resulted in many coaches turning towards some slightly riskier picks in the hope that they can either breakthrough at new clubs or gain extra midfield time. Isaac Heeney is an especially popular pick. Whilst he may be an exceptional footballer and will certainly rotate through Sydney’s midfield, will he become a permanent member in 2017? I doubt it. Of all the midprice forward picks I think Steele is the most likely to be rewarded with a full time midfield role. This spells out breakout year! Steele is primed for a breakout season, aged 21 and heading into his third year of AFL. His body has matured and I reckon he’s ready to take on the competitions best contested ball winners. Whilst St Kilda have some promising midfielders running around, Billings, Dunstan, Armitage, Newnes, Acres and Freeman is hardly untouchable. Jack Steven and Seb Ross are locks in their engine room, but I think there’s plenty of room for Steele to make his way in as well. Having averaged just 71 last year there’s plenty of room for growth! As just mentioned, he only averaged 71 last season. In fact he has never scored a ton! Even though this isn’t a true reflection of Steele’s potential, the fact is that he hasn’t yet proven himself at the highest level. We can speculate as much as we want, and I could stare at his NEAFL stats until I go cross-eyed. It still won’t help me sleep at night after putting my faith in a bloke based of his numbers in a farmers league! Another factor playing in the back of my mind is Steele’s end of season surgery last year. The young Saint had surgery on his foot in September to repair a fractured metatarsal. He’s only just beginning to train with the main group, meaning he has missed out on at least a month of full training with the midfield. I think he’ll be just fine as he has been running and seems to be fully fit, but I’d be much more comfortable selecting him on the back of a perfect pre-season. Not an ideal preparation. Unfortunately Steele doesn’t receive any discount in Fantasy as he played 10 games last season, meaning we’re paying for the same level he produced in 2016. Even though there’s plenty of evidence to suggest he can greatly improve on that 71.6 average, he sits at an awkward price leading into 2017. A big factor will be the quality of forward rookies to choose from. I’ll leave this research to our man Jeppa, but if there’s a heap of promising forward rooks $200k cheaper than Steele, justifying the risk will become a little harder. By the same token if we’re short on quality rookies then Steele suddenly becomes a more realistic selection! Having had a quick play around with the pre-season drawing board, I’m noticing that my early teams are stacked with Round 11 bye players, especially in the forward line. I’m not usually too fussed about bye rounds in my Round 1 team, but having over 3 keepers from the same bye round does carry an element of risk. Steele could be considered expendable before then, however things never work out as planned. JACK– In my eyes Jack’s a Jack. Let’s face it, it’s a risky selection! It was at this time last year that I nailed Lachie Hunter (Had to mention it) in the Deck, however we don’t get a free preview at the breakout contenders without the vest. It’s going to require some kahunas to gamble on midpricers this season, but no great reward comes without an element of risk, otherwise we’d all be millionaires! There’s no guarantee that Steele can transfer his NEAFL form to the big time, however I truly believe that he’s a gun and can make his name at the Saints. A pre-season watchlist for sure. He’s in my early drafts! Also keep an eye on him in your draft leagues, he could be a slider! What does Steele have to average to justify selection? 90+, I'd need him to be a keeper! Hadn’t really paid him too much attention due to three years of limited output, but this has definitely put him in the fight for Heeney’s spot. As it stands the lack of scores and the unknown nature of his role and output has Heeney well on top, as at least we’ve seen him play well as a winger, but the Saints do have a solid fantasy game for the insiders. Kinda makes Steven more tempting too now that I think about it. Very good deck article Matt. All prompt thoughts but this one covered all the pros and cons I could think of. Thinking no at this stage but completely agree with your reasons why he might come back into calculations. Cheers Kel, I’m not sold either way yet! Pre-season watch for sure. With Ryder already in due to his FWD/RUC swapping, it only leaves room for one more mid price forward and I think Heeney is well ahead of Steele. Steele may well reach your prediction for him but I feel Heeney will go 90+. I believe there are times; like now, when the gov’t should make investments to create jobs, but this gov’t is not doing this. If we had spent 13 billion dollars a month for the past ten years in America rather than Iraq; we could have created a vaccum tube, supersonic magnetic train system spanning coast to coast. This would not only create jobs in construction/tunneling; it would make NYC,ï»¿ DC, San Francisco, Seattle, New Orleans, etc. an hour away from anywhere (in the US). Paul, I’m thinking of getting the Focus with the Patriot microsd. Have you had any problems with your microsd? slow downs? syncing Zune? and have you used up the 8 GB of internal memory yet? Minor correction; this is Jacks 3rd year not 4th. Was taken in 2014 draft.